Polishing die tools is a required practice in the automotive industry to reduce surface roughness, prevent galling, and prolong service life. Daimler AG wanted to automate their polishing operations for stamping dies used in sheet metal forming of automotive body panels. Manual polishing of die surfaces is labor intensive and time consuming. It is also difficult to manually maintain surface consistency between die tools when the operator’s technique and level of fatigue vary from part to part. Subsequently, this impacts the consistency and quality of the stamped car body components and how they mount to the vehicle frame. Luxury vehicles such as the Mercedes-Benz S-Class and E-Class require components with exemplary finish and fit. Hammer peening has been shown to improve polishing speed, consistency, and surface quality. It also increases the surface hardness by up to 30 percent, thereby increasing the service life of the dies. Daimler wanted to take it a step further by using a robot for hammer peening. The PhD responsible for developing procedures at Mercedes-Benz Werk’s manufacturing equipment center in Sindelfingen, Germany, and who spearheaded development of the hammer peening process, knows firsthand the advantages of robots. He says robots are less expensive than dedicated CNC machines and provide greater reach on large workpieces, in this case dies weighing up to 25 tons and as large as 5 m x 2.5 m. Robots are also more flexible and can be used for different applications. To maximize their equipment investment, Daimler planned to leverage robotics’ renowned flexibility to use the die shop’s robot cells for other processes beyond hammer peening. But first they would have to program the robotic hammer peening process, which would prove to be a formidable challenge. In the hammer peening process, the surface of the die is polished by repeatedly striking it with a high-frequency impact spherical hammering tool at over 200 hertz. Millions of impact points are required by the hammer head to ensure homogeneous surface quality. To program a robot to manipulate the hammer peening tool with such frequency and precision was a monumental challenge, especially with conventional software tools. 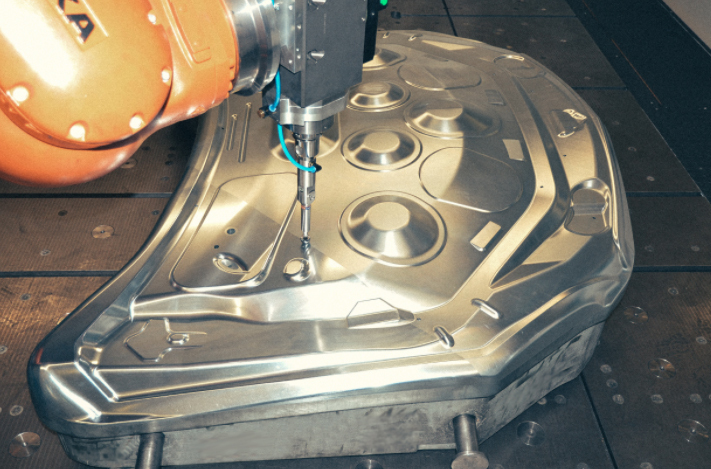 Even using two to three different software platforms for code generation, calculating toolpaths, and converting to robot motion, Daimler’s existing programming tools were unable to handle all of the computations required to program a six-axis robot for hammer peening. Daimler approached the Robotmaster team to help develop the robotic process and the software to program the robot. Upon initial trial of Robotmaster offline programming software, Daimler was able to realize an immediate 50 percent time savings compared to previous software tools. But this was just the beginning. Processing 3 million path points is no easy task. Daimler and the Robotmaster team embarked on an extensive, three-year R&D project to enhance and refine the robotic hammer peening process. 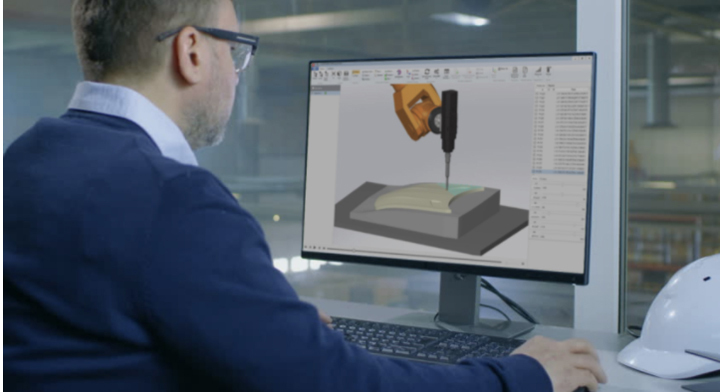 The Robotmaster team worked closely with Daimler, collaborating on custom toolpath creation and ongoing development of the Robotmaster software to improve programming time and ease of use. Daimler says they could not have developed this hammer peening process or the other robotic processes without the dedication of Robotmaster’s team. Robotmaster spent months working with the automaker, making sure they understood what Daimler wanted and adapting the software for their specific applications. Robotmaster alone was able to do what no other software tools could accomplish, even in combination. The offline programming solution not only handled all of the calculations where others failed, it surpassed the customer’s expectations by optimizing the entire robotic hammer peening process. Programming time substantially reduced by 70 percent. Robot kinematics optimized, including singularities, collision detection, reach and joint limits. Robot transitions optimized to ensure smooth motion. Programming for large, complex dies with millions of path points is easy and error-free. Total programming time for one workpiece, including the time to import a CAD file and create a toolpath, was reduced from 12 hours to only 3.5 hours. Robotmaster’s kinematics solution accounted for only 45 minutes of that total programming time, a substantial improvement over previous attempts with other software platforms. Pivotal to the Robotmaster solution was one of the fastest kinematics resolution engines available. It solves singularities, reach and joint limits, and any other sudden robot motion that can abruptly change the robot’s configuration or cause errors. The proprietary kinematics and collision detection engines check for errors, while the optimization tools smooth the robot motion. Transitions are clean. Unnecessary joint movements are minimized. The software also needed to control external axes with ease. Daimler’s hammer peening cell uses a KUKA KR 500 robot mounted on a rail to increase its reach, plus two rotary axes to position the workpiece. Robotmaster can manage up to 11 axes simultaneously, including a six-axis robot and five external axes. The simulation and optimization tools automatically support rails and rotaries as needed. Not only was Robotmaster alone able to do what no other software tools could accomplish in combination, the software solution can be used for multiple path-intensive processes. Once Robotmaster proved themselves in the hammer peening application, Daimler began to explore using the software for other processes. A second robotic cell was commissioned. This one was designed to be multifunctional. By simply changing out the end-of-arm tooling, the robot can be used for a variety of processes from laser hardening to drilling. Robotmaster provided the multifunctional operation Daimler was looking for and helped avoid collisions and singularities. Daimler soon learned that Robotmaster could handle any process they put in front of it. The software was both powerful and easy to use. It simplified the programming for a host of different robotic processes with one software platform. 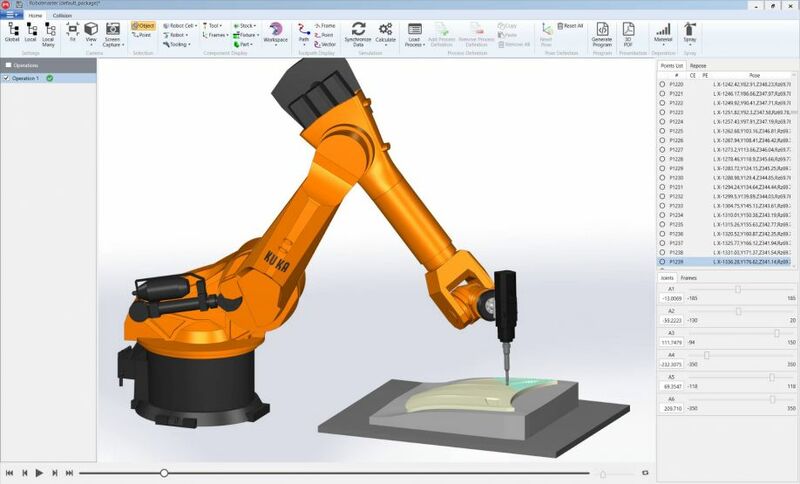 Daimler used Robotmaster software to program a robotic laser hardening process for their stamping dies. By laser hardening the fillets, they could gain 30 percent more service life from their die tools. Robotmaster was also used to program a robotic laser cladding process to build up worn surfaces of dies. Today, several seats of Robotmaster software are used for production in three Mercedes-Benz die shops across Germany and in Daimler’s Digital Factory, where the core of their automobiles are built, combining physical and digital processes in Daimler’s industrial production. Ultimately, Daimler was able to accomplish their goal to optimize and economize their processes by creating multifunctional robotic cells for hammer peening, laser hardening, laser cladding, milling, drilling, and induction hardening. All programmed with Robotmaster software. Ease of use played a substantial role in Daimler’s adoption of Robotmaster software for offline programming. The Robotmaster Interactive Simulation Environment (RISE) is extremely powerful, providing an intuitive click-and-drag user interface for modifying the robot’s positions and trajectories. Norbert Krach, managing director of robotized rm systems GmbH, Robotmaster’s local reseller in Germany, explains how Robotmaster’s user interface and proprietary technology provide unmatched control and flexibility. Daimler continues to explore the use of robotics for different processes in the die shop and rely on Robotmaster to accommodate their robot programming needs. Intercam’s Lingappan says the automotive industry owes a debt to Daimler for their work in this field.